I have also fleshed out a number of additional symbols and accented letters that has seen the number of code pages supported increase to 12 pages and made a large number of tweaks to the italic version which was a last-minute addition to 0.6 (PR6) and had a number of errors especially round the accented letters. There is still some work to do on the sizes above and below 10 point (again) as well as fleshing out a few more symbols, letters and italicizing additional letters such as a curly k and rounder e which I hope will be finished towards the end of this week. I forgot to clarify that what I installed is the humane theme. I’m already using your current Envy Code R font and look forward to this update. I meant the curly quotes – not the braces. :-) (Unicode characters U 2018 through U 201F.) In most fonts those aren’t very curly, which makes it relatively hard to tell that they’re curled and which way they’re curled. I like the curlier braces you drew too though – same reason: easy to tell that they’re curlies. Nice work on the box drawing characters! Can’t wait to give it a spin. Looks great! You do fine work. I’m looking forward to test driving 0.7 as soon as you’re ready to release it! 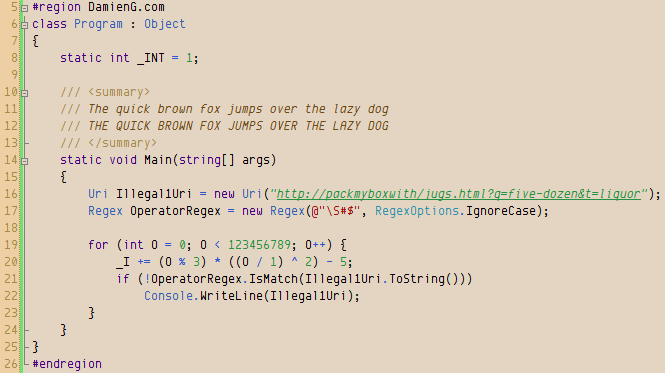 I’m still using DejaVu LGC Sans Mono for NetBeans, but Envy Code R has taken over on both Linux and Windows for all my other monospaced font needs! Damien, Just an FYI, this link doesn’t lead to the latest upgrade anymore: https://damieng.com/envy-code-r. Clicking it at the bottom of this post just leads you in a circle.